We never outgrow the need for a family. "Never venture out alone"- a lesson shared by Desiree in this great story about older youth adoption from Casey Family Programs. FFF has a webpage dedicated to resources for youth and young adults. Adoption Month calendar of ideas for celebrating the month from Adoptive Families magazine. Fairfax County Department of Family Services is hosting an Adoption Awareness Month Event on November 18. Come join the fun! Ideal for all families, this free workshop offer practical suggestions for making meaningful changes to improve your family's overall health and wellness. Join Dr. Klimenko and FFF in Herndon. Youth 14 and older are welcome. Refreshments served. More information HERE. Whether at home or around the IEP meeting table, many of us struggle with conflict in our personal and professional lives. Join two professional mediators for a free Cruising through Conflict: How Harnessing Brain Chemistry can Tame Tough Conversations training, Monday, December 5 in Fairfax. Q: Our adoptive family is struggling to find counselors who understand our specific needs. It seems like most of the therapists we try don't recognize or know how to help us with the attachment and trust issues that we are dealing with our daughter. Any suggestions? A: Yes, we hear this concern from a lot of formed families. Selecting the right provider, for behavioral and mental health, physical health, psychoeducational evaluation and even tutoring can be really challenging for adoptive, foster and kinship families raising children and youth with "extra-special" needs. While FFF does not endorse any specific providers, our updated Formed Families Resource Directoryis chock full of organizations, agencies and private providers that other families have found helpful. Download your copy HERE! The Child Welfare Information Gateway offers a guide to Selecting and Working With a Therapist Skilled in Adoption. Our friends at the Center for Adoption Supports and Education (C.A.S.E.) have established a Training for Adoption Competency program. A Directory of Adoption-Competent Professionals is also available. Consider asking potential providers if they are adoption competent or are willing to take the training. In addition, NAMI has a guide for families choosing evidence based practices in mental or behavioral health. Support groups and other connections between adoptive and foster parents and kinship caregivers are great sources of information about tried and true providers. Our friends at NewFound Families offer a weekly Facebook chat and a number of support group opportunities. Above all, take the time to develop a set of questions to discuss with potential providers. Trust and open communication between parents or caregivers and service providers is critical to effective treatment. Schedule a "test drive" appointment to meet the provider and discuss his or her experiences and comfort with addressing your family's needs. As appropriate, the child or youth in your care should also meet the provider and discuss treatment goals. We are thankful for all the free and low-cost training events available to parents, caregivers and professionals in our area. Take advantage of these great offerings from FFF and friends! November 6- "ADD and Loving It" film screening and discussion, sponsored by Fairfax ADHD Resource Group, Fairfax. November 6- NAMI of Northern Virginia FallFest, Herndon. November 7- Screening of Resilence: The Biology of Stress and the Science of Hope film, sponsored by the Fairfax Trauma Informed Care Network, Fairfax. November 10, 6 PM- Building Healthy Families: LEAN Essentials workshop with Dr. Klimenko, hosted by FFF, in Herndon. November 10, 11 AM- Mindfulness and Movement for Caretakers webinar, sponsored by PEATC. November 10, 5 PM- What To Do During Police Encounters: Town Hall and Resource Fair, hosted by Alexandria and Arlington DSS, Arlington. November 13- Exceptional Schools Fair, Washington, DC. November 17- Moving on to Life in the Community Transition Resource Fair, Hosted by Fairfax County Public Schools Parent Resource Center, Burke. November 29- Becoming an Active Member of Your Child's IEP Team, Arlington Public Schools Parent Resource Center, Arlington. January 19, 2017- The Power of Play: A Relationship-Based Approach to Improving Behavior workshop hosted by Loudoun County Public Schools Parent Resource Services, sponsored by FFF, Ashburn. 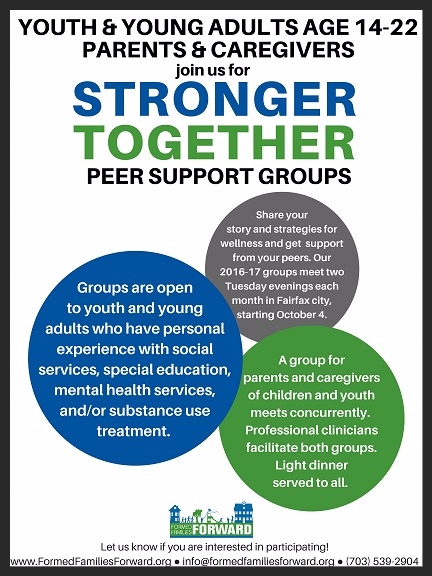 Our Formed Families Forward Stronger Together peer support groups for youth and young adults ages 14-22, and for parents and caregivers, started up in October. The facilitated groups meet two Tuesday evenings a month in Fairfax and dinner is provided! We have a great group of youth and young adults, and of parents and caregivers, who have initiated our 2016-17 groups. Stronger Together has open enrollment so we welcome new youth and young adults who have personal lived experience with social services, special education, mental health services or substance use treatment. Opioids - What's all the hype? Did you know that one person in the US will die from an opioid-related overdose every 20 minutes? That marijuana and alcohol are gateways for opioid abuse and that addiction to alcohol, marijuana, cocaine and other opioids places a youth or adult at much higher risk for heroin addiction? That opioid and other drug overdose-related deaths are increasing at rates not seen in years? Formed Families Forward participated in a recent community training about the opioid epidemic in Virginia, held at GMU. 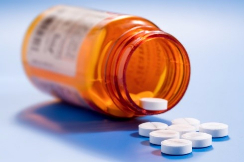 As an October 31 study reports, there is a concerning rise in opioid-related poisonings in children and teens. Learn more HERE about the epidemic and strategies for community and families to increase awareness and responsiveness. professionals who care about special needs, adoption, foster care and kinship care. We share events, data, and other resources that help make raising formed families a little easier!